Rest Easy Heat is dedicated providing quality service in the eradication of pests with an earth friendly approach. Rest Easy Heat provides over 8 years of pest control experience. 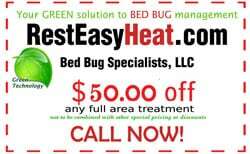 Rest Easy Heat offers a quick and reliable solution to your bed bug concerns. We educate our customers and provide excellence in all aspects of bed bug control. We understand that having bed bugs in your home is one of the most unsettling problems someone can have. From our experience, most homeowners that have bed bugs do not have severe infestations, rather normal situations. By quickly identifying the infected rooms, we can discuss the findings with you and then discuss the next step to eliminating your current bed bug problem. We can provide you with the perfect method of remedial services to fit your budget. We assess the situation, locate the bugs and give you the service you need.